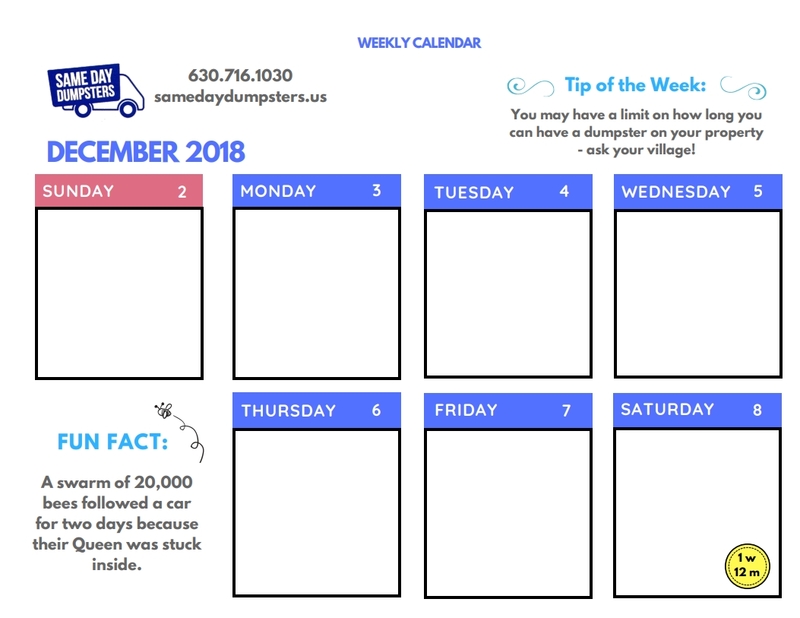 Why buy a calendar when Same Day Dumpsters Rental will give you one for FREE! Take advantage of our weekly calendar ready for you to use. Download or Print Out Weekly Calendar FREE Right Here! The 10 Craziest Things Found Inside A Dumpster! While winter may be cold and desolate, there are still plenty of organizing projects you can tackle inside to help yourself come out of clutter for the year ahead. Who Voiced Tony the Tiger? Whether it’s an attraction in Disneyland or on one of your most favorite animated classics, you will never believe which Christmas icon is responsible for them. Hungry Wolves and Wacky Romans – What You Don’t Know! Named after a god with two heads, the month of January was just one of the many things influenced by those wacky Romans! A FREE calendar for the third week of April that you can download and use for whatever you deem necessary! Happy February! A free weekly calendar for the first week of February that you can download, print and use. A free calendar for the second week of March that you can use to take notes or use for scheduling purposes.